I had a hard time settling down at the wheel tonight. I’m feeling pretty scattered these days, between Mick being gone and his mother so ill, and work being brain-suckingly intense, and a bunch of smallish tasks here at home that NEED to be done that I just haven’t gotten to. So I just allowed myself to sit and feel restless as I was spinning, and gave myself permission to keep spinning through that. 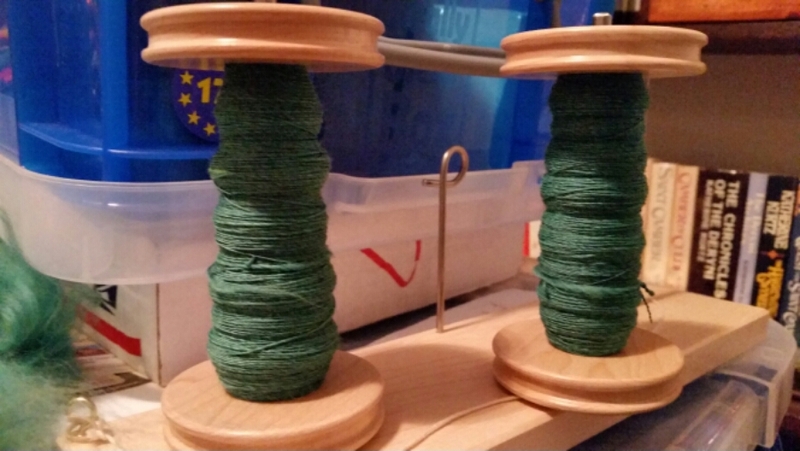 It worked, happily – I completed the second bobbin of this merino trio that I’m spinning now. The real problem is that I haven’t been doing my morning journaling. Done daily, that’s my best tool for getting my thoughts straight and getting stuff done. I have been worse than haphazard lately, and I am paying the price for that now. SO. Tomorrow morning, I will write.